"My step-brother fixes this dish every weekend for his three boys and they all love it. 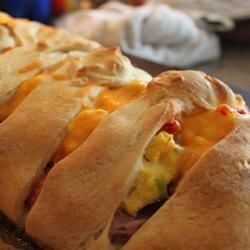 A great breakfast dish that will keep them talking about it all day!" Beat milk and cream cheese together until smooth. Mix in eggs, and season with salt and pepper. Heat a lightly oiled skillet over medium high heat and cook egg mixture until eggs are almost set. Arrange the crescent rolls from one package into a rectangle shape on top of a lightly greased cookie sheet. Place rolls from remaining package along the edges of the two long sides of the rectangle, with the broad half of the rolls on top of the first layer of rolls, and the pointed ends extending over the sides of the pan. Arrange the ham in a layer down the center of the dough. Spoon the cooked egg mixture on top of the ham and then sprinkle the cheddar cheese on top of the eggs. Bring the corners of the rolls together over the cheese to form a 'braid' shape. Kids loved, easy to make! The only change I made was to use 4 oz of chive/onion cream cheese.